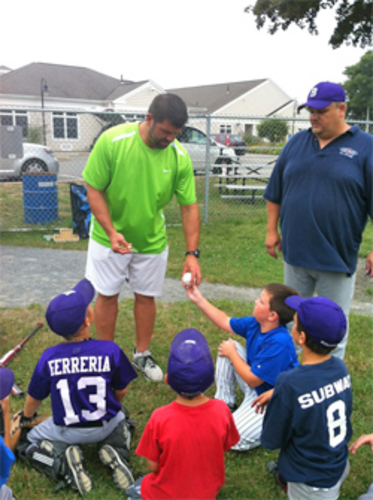 BOURNE --- Former Cape League MVP Jason Varitek thrilled members of the Bourne 8-year-old All-Stars, their coaches and several of their moms Thursday evening when he stopped by the team's practice in Buzzards Bay. Looking like he could still catch both ends of a doubleheader, the recently retired Red Sox player visited the players for about 20 minutes, shaking hands with the kids and signing bats, balls, gloves and baseball cards. Varitek, who stopped by as a favor to a Bourne Coach, was accompanied by his wife and daughters in the surprise visit. Assistant Coach Marc Ferreira arrived just in time to catch Varitek, who won the Cape League MVP while playing for Hyannis in 1993. Ferreira later told the players that the former Sox captain was the ultimate example of a baseball player, a hard-nosed "dirt dog." Apparently inspired by their meeting with the two-time World Series champion, Coach Dan Dunn's team followed the visit with a sharp practice, as the players prepare for a game Friday in Falmouth and a tournament next weekend in Mashpee.